There's more than dinosaur bones in eastern Utah. As we are in the midst of a craft brewery explosion around the Wasatch Front, it's easy to forget the breweries that service the less-populated areas of the state. Towns such as Vernal, which have craved craft suds for more than two decades, finally got a beer oasis in April 2016 when Vernal Brewing Co. opened its brewery in Utah's dinosaur country. I got my hands on a couple of their high-point offerings this week, and they're far from small-town brews. 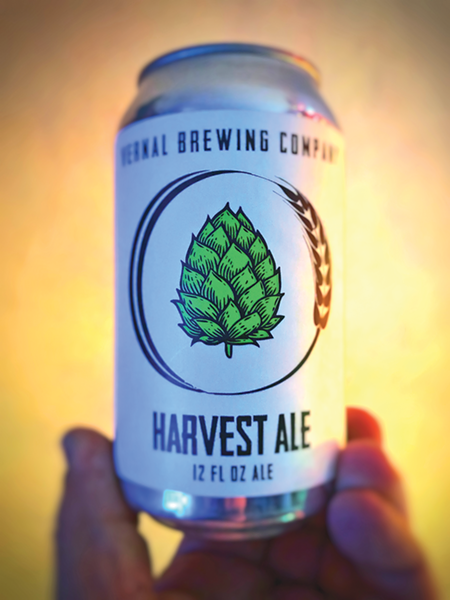 Vernal Harvest Ale: When the term "harvest ale" comes up, most beer drinkers think of fresh, hoppy pale ales; this is not that. Instead, it pours a medium to moderately deep copper/amber brown with a very small head, off-white in color and only about one centimeter thick. The first noticeable scent that hits the nostrils is a decent dose of malt sweetness. It's mostly caramel with a touch of brown sugar, light booze and a smack of piney hops. At first sip, this beer displays its unique flavor profile. The sweetness from the scent is there early on in the taste of the beer, but not nearly as strong, instead replaced by a big caramel malt flavor. Some hop bitterness moves in more quickly in the taste than in the nose, giving the beer a light to moderate piney bitterness that carries throughout the back half. Underneath the hops' bitterness is a mild, butterscotch flavor that moves in and out repeatedly throughout the drink. Overall: This is an interesting beer, which seems to be a hybrid of barleywine and old ale. It has some sweetness and sturdy bitterness, but really doesn't lean toward either. It is a very balanced beer in flavor, and displays surprisingly little noticeable alcohol for its 10 percent ABV. Vernal .50 Calibur IPA: The body is a golden copper color, deep with shades of red and brown and some haze from the beer's cold temperature. The nose is not overly sweet and a little vegetal at first. Further whiffs give way to some nice fruity aromas of berries, mango and pine. The vegetal taste arises briefly at the beginning. It then leads into those really nice fruit notes; I get a good amount of berry, grapefruit peel, biscuit and light caramel flavor. With these flavors comes a moderate grapefruit hop flavor that grows stronger as the taste moves on. While the caramel fades after the initial taste, some light tropical flavors of papaya, mango and some tangerine become more pronounced. These flavors are rather light and are soon subdued by a pine hop bitterness, as well as a slightly boozy taste. A rather bitter and resinous pine and grassy flavor come to the tongue at the end, largely taking over the taste to leave its mark on the tongue when all is said and done. Overall: It's a moderately good double IPA. The aroma was quite nice though it was a bit deceiving. The taste was more bitter and less fruit-balanced as those whiffs would suggest. It does, however, give a nice hoppy bite to the taste buds at the end of the taste, and is rather enjoyable to drink. Vernal Brewing Co. cans seven low-point beers and four high-point offerings, and most can be found along the Wasatch Front. But if you want their special house beers, you're going to have to make the trek to Vernal. As always, cheers!